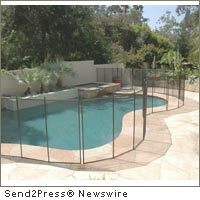 VAN NUYS, Calif., March 25 (SEND2PRESS NEWSWIRE) — Steve Sadinsky, President and CEO of Guardian Pool Fence Systems, Inc., is proud to announce that their 5 foot tall polyester mesh pool fence has been approved by the City of Los Angeles to meet the building code. This is the first time that the city has given their approval for such a fence. Guardian Pool Fence Systems invented and manufactures the only removable, climb-resistant gate in the world. Their pool fence structure requirements includes locking sleeves and a self-closing gate These fence systems are designed to protect small children from getting into the pool area. Founded in 1995, Guardian Pool Fence Systems manufactures over eighty models of fencing. They also produce their patented self closing gate that is designed to be climb resistant. To date, they have sold over fifty thousand pool gates and pool fence systems. Guardian and its trained pool fencing dealers have installed tens of thousands of pool fence installations worldwide. For more information, online visit: http://www.guardianpoolfence.com . Guardian Pool Fence Systems, Inc., 14715 Aetna St., Van Nuys, CA 91411; Tel: (800) 366-SAFE (7233). News issued by: Guardian Pool Fence Systems, Inc. Original Keywords: Steve Sadinsky, City of Los Angeles Mechanical Building Code, removable, climb-resistant gate, pool gates and pool fence systems, polyester mesh pool fence, California business news, Van Nuys, L.A. construction codes, swimming safety systems Guardian Pool Fence Systems, Inc. Van Nuys California VAN NUYS, Calif.
News Source: Guardian Pool Fence Systems, Inc.
More from Guardian Pool Fence Systems, Inc.
RSS News Feed for Guardian Pool Fence Systems, Inc.
REFERENCES: Building Products News, Steve Sadinsky, City of Los Angeles Mechanical Building Code, removable, climb-resistant gate, pool gates and pool fence systems, polyester mesh pool fence, California business news, Van Nuys, L.A. construction codes, swimming safety systems Guardian Pool Fence Systems, Inc. Van Nuys California VAN NUYS, Calif.